Set against the backdrop of Helmsley Castle and Duncombe Park, the five acre garden, originally built in 1756, has recently benefited from 15 years of extensive restoration. 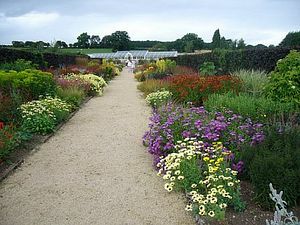 The Double Hot Border forms the gardens central spine, extending for 120m, it explodes with colour from June to September. Off the main spine we have a selection of smaller garden rooms including a contemplative garden, a white garden, rose and peony borders and new for 2011 a cottage flower garden. The garden has dedicated vegetable and trained fruit growing areas, half of which are individually tended by residents of the local community, the remainder grown by ourselves and used exclusively in our award winning vegetarian Vinehouse Cafe. The range of Victorian greenhouses house a collection of vines, tomatoes and hot house plants. The garden is a registered charity providing horticultural therapy for the local community. Plants and Produce - Plants are on sale together with vegetables, herbs and seasonal fruit.